Francis was born in Sri Lanka (formerly Ceylon). His father was the Reverend James Bacon. Other family details are not available because of the country involved. 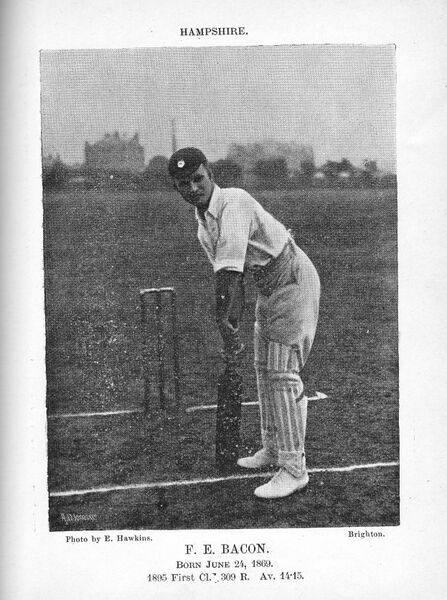 It is known that Francis was resident in the UK from at least 1895 because he played 75 games for Hampshire Cricket Club between 1895 and 1911. He is resident in Basingstoke at the 1901 census, living with his wife Fanny, their 2 children plus 3 daughters from Fanny’s previous marriage. Fanny Wallis was born in Eastleigh in 1859 and had previously married Valentine Adams on 25th December 1883, in Winchester. They lived in Basingstoke and had 4 children – 3 daughters and 1 son. The son, Edward Charles Wallis, was away at school (in Basingstoke) during the 1901 census. Roger Noel b. 1901 Basingstoke d. 1985 Fordingbridge. Married Mary Christiana Leslie-Jones in Peshawar, India on 28 March 1933. Roger was a member of the Indian Police Force. By the time of the 1911 census Francis and Fanny were living in Bashley Lodge, Clifton Road in Shirley, together with their son Harold. Whilst going to the aid of another British vessel which had exploded in the east English Channel the Aries hit a mine laid by UC-6 under Kapitanleutnant Matthias Graf von Schmettow. The vessel broke in two and had sunk inside one minute, with the loss of the commanding officer plus 21 others, only 5 crew were rescued. Several crew members are commemorated on the Trawlers & Minesweepers Patrol Memorial in Dover, but Francis is not among the names. It is not altogether obvious why Francis is buried in a churchyard in Denmark. Aries sunk just off the Kent coast; perhaps the body was found on the Danish coast? Built in 1880 by the Barrow Shipbuilding Co Ltd, for the Victorian industrialist Sir James Ramsden, to his own design, as an ocean-going steam yacht. “Aries” later passed into the ownership of the Duke of Leeds, and she became a familiar sight at Cowes during the 1890’s. The yacht was offered to the Admiralty for wartime duties in August 1914, and was both gladly and gratefully accepted for same, at that time she became H.M. Yacht Aries. Whilst in service an armed yacht she was mined in the English Channel off the coast of Leathercoat Point, near St. Margaret’s Bay, Kent. Although several crew members are commemorated on the Trawlers & Minesweeping Patrol Memorial, one of those notably missing from same is 46 year old Assistant Paymaster, Francis Hugh Bacon, Royal Naval Reserve, who was a famous former Hampshire and England cricketer. Francis was educated at St Augustine’s College, Canterbury, Kent. James Ramsden the vessels first owner was a former superintendent of the railway and first mayor of Barrow. In view of where H.M.Yacht Aries was sunk, it perhaps should be pointed out that Leathercoat Point, near St. Margaret’s Bay, Kent is also the cliff top location of the Dover Patrol Memorial.